Jingles the reindeer poses with owner Sonya Benhardt and young fans at Swanson's Nursery in Seattle, Washington. Holiday shopping is in full swing at Swanson's Nursery in Seattle, where you can buy a Christmas tree, pick up a festive wreath for the front door, or check out Santa’s sleigh. A live reindeer, sharp antlers and all, stands next to the sleigh while customers line up to have souvenir Christmas photos taken in the driver’s seat. Images, inflatables and statues of reindeer are common fixtures during the U.S. holiday season. As the animals who pull Santa Claus' sleigh while he delivers presents, they are a key part of children's Christmas stories. While the reindeer adorning holiday displays are rarely real, that's not the case with Reindeer Express, which rents out live reindeer for holiday promotions and pageants. 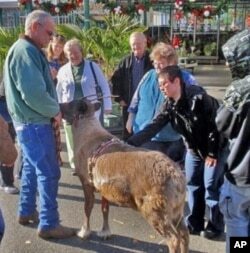 Ed Benhardt, in green jacket, instantly draws a crowd with his live reindeer. Sonya Benhardt and her husband, Ed, own the business. It started with two domesticated reindeer in 1998. Now there's a herd of about 40 on their ranch near the small eastern Washington town of Reardan. The National Reindeer Owners and Breeders Association estimates at least 50 other rental operations thrive in the USA. When they’re not renting reindeer, the Benhardts focus on raising and selling wallabies, exotic birds and waterfowl. In the United States, most public holiday scenes revolve around Santa. However, churches often erect religious Christmas displays.These usually include nativity scenes, featuring statues of the baby Jesus, his mother Mary, her husband Joseph, and the three kings who came bearing gifts for the child, as well as animals, like lambs, donkeys and camels. The Benhardts are one of a handful of ranchers to diversify into camels. Curly the Camel is fully booked for the 2012 holiday season. "We were approached to do a couple of nativities," Ed Benhardt says. "Then we started getting some interest in leasing them out just the same way we do with the reindeer." Ed says the big, shaggy beasts do fine here in the chilly Pacific Northwest. "I knew that they would winter well. They winter very well." He says his five camels are fully booked for the holiday season. "I think way outside the box. So, a lot of stuff I do, people will look at me and say, 'You're crazy.' A couple years later, they'll go, 'Wow, you're really smart.'" It does sound smart when you hear how much it costs to get a live camel for your nativity scene: $500 per day, plus mileage. A pair of reindeer, with a handler, rent for $200 per hour, with a three-hour minimum. Churches, garden centers and nurseries are leading customers. Other marketing targets include shopping malls and community tree lighting ceremonies. 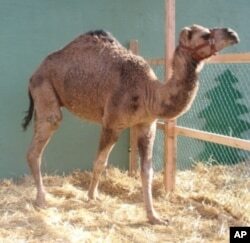 In Seattle, Swanson's Nursery leased one camel and some reindeer for six weeks. Retail manager Leslie Bruckner insists the price is - in her words - "So worth it." "We have people that come and visit consistently week after week because they love the animals so much," she says. Kids and their parents press around the reindeer enclosure, debating which one is Blitzen and which is Dasher, two of the animals named in the poem, "The Night Before Christmas." Sonya Benhardt has a ready answer when children ask her why the reindeer don't simply fly away. "They can only fly on Christmas Eve," she tells them, "because Santa gives them special, magic dust to make them fly." Sonya says she purposely didn't name any of hers Rudolph - the famed reindeer with a glowing red nose - so she won't be forced to explain why his nose doesn't shine so bright. Oregon's Timberview Farm has solved that dilemma. They do rent a Rudolph, but with the caveat that his nose only glows red on Christmas Eve.